An awesome idea with a terrible power source. 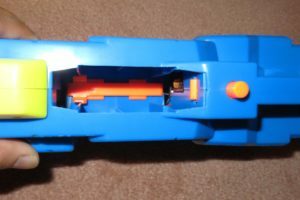 Spinning barrels are always an enticing feature of blasters. Regardless of how impractical they are, they’re just plain cool. 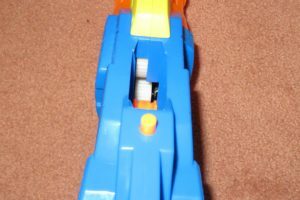 The Buzz Bee Ultra-Tek Cyclonic promised spinning barrels along with full-auto flywheeling which, as seen with the Ultra-Tek Brute, we know the company can do reasonably well. 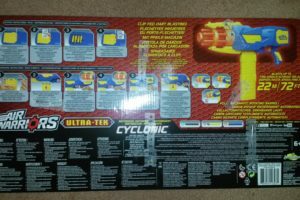 I was rather excited, therefore, to receive a Cyclonic with the hope that it, like the Brute, could be used as a budget, full-auto flywheeler. Everything in the Cyclonic package. Disclaimer: This blaster was sent to me by Buzz Bee Toys for review. I would like to thank them for their support. 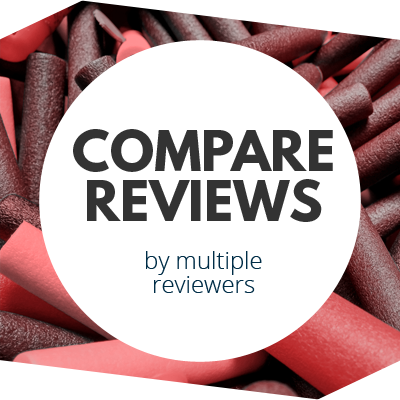 Note that it will not bias the review in any way. Same old same old box design. Cable ties holding in anything big, with the darts held in a plastic tray. 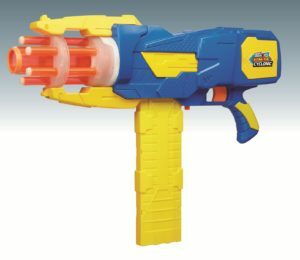 The Buzz Bee Cyclonic is quite a big and bulky blaster. It’s very chunky to support the spinning barrel, yet has no stock or rear weight to balance it. It feels a little clumsy to handle compared to most other blasters. Close up of the "fiesta" texturing. Looking at the other texture pattern. 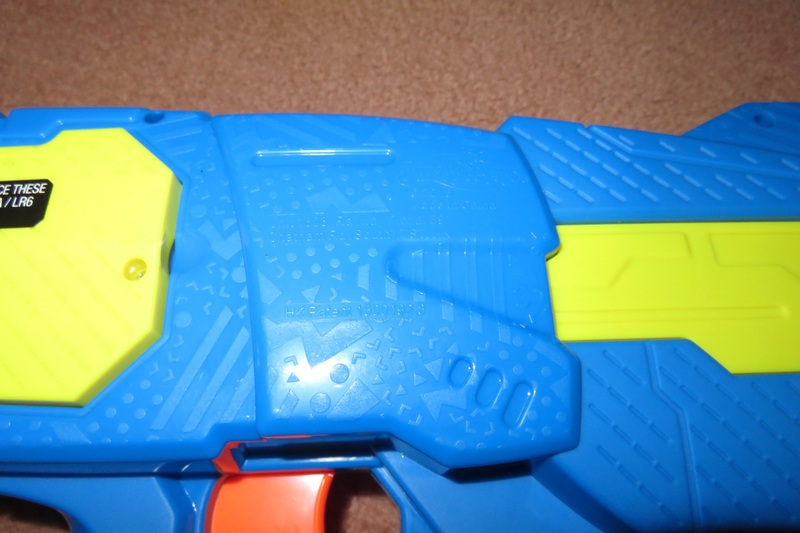 The Cyclonic features Buzz Bee’s “fiesta” pattern shell detail on most of the side faces. It also features a diagonal hatching on some side areas. This hatching may be indicative of what we’ll be seeing soon with the “carbon fibre” texture we’ve been told will be used on newer waves. Close up of the battery tray cover. 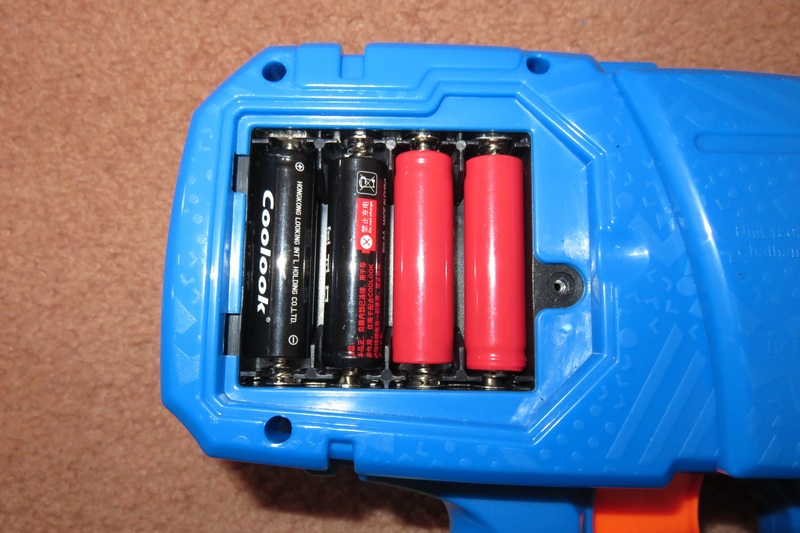 Battery tray exposed. Seen here with 2 IMRs and 2 dummies. 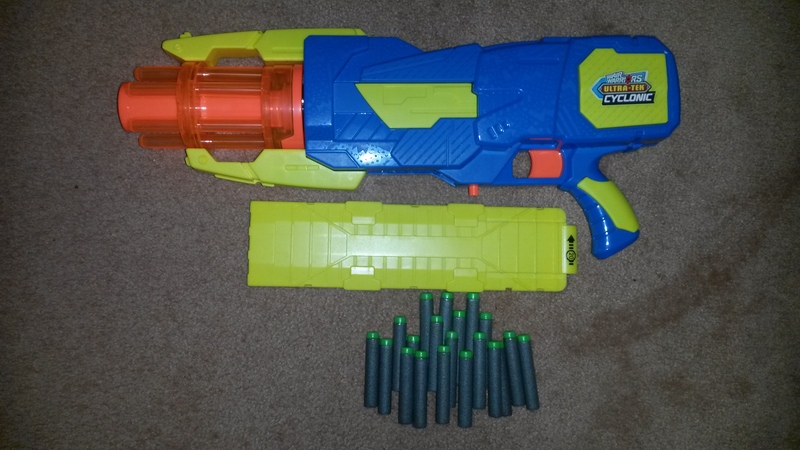 The Cyclonic is powered by 4 AAs, which are stored in a tray at the back of the blaster. 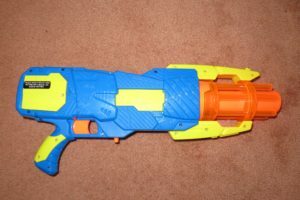 AAs are quite insufficient for this sort of blaster and its power demands, which I’ll go into more detail in Performance. Close up of the spinning barrel. 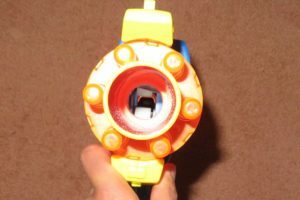 Looking in the front of the barrel. The spinning barrel is one of the Cyclonic’s main aesthetic features. But functionally, it’s just a faux barrel with mini faux barrels molded on the side, same as most other spinning barrels on blasters. 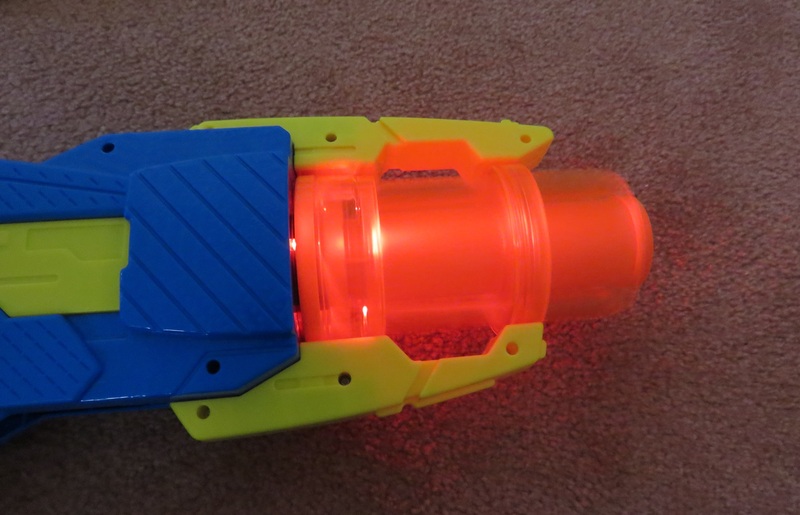 It also lights up courtesy of two LEDs mounted on the sides of the barrel. In contrast with the rest of the blaster, the Cyclonic’s handle is relatively small and slim. It’s fairly well designed, with good curvature and shape, though it could benefit from more bulk. 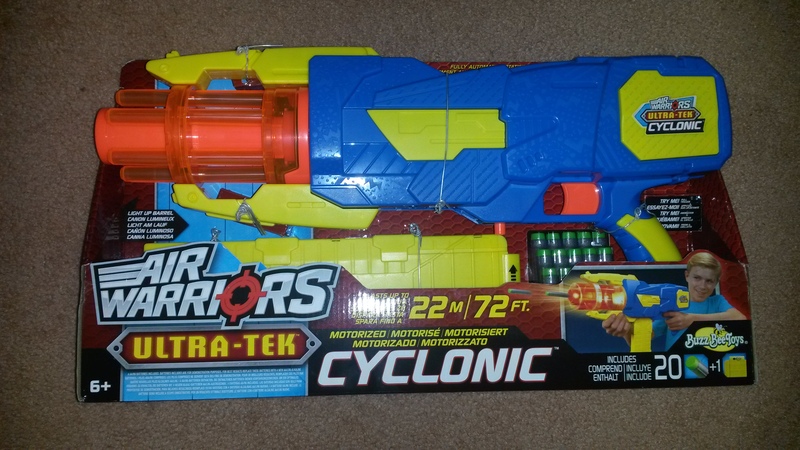 The Cyclonic has quite a long trigger pull, even compared to a typical semi-auto Nerf flywheeler. 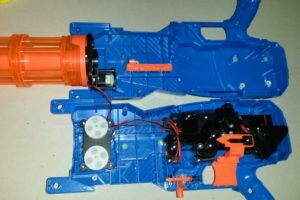 This accomodates its dual-stage trigger system, in contrast with Nerf’s flywheelers just having a separate rev trigger. 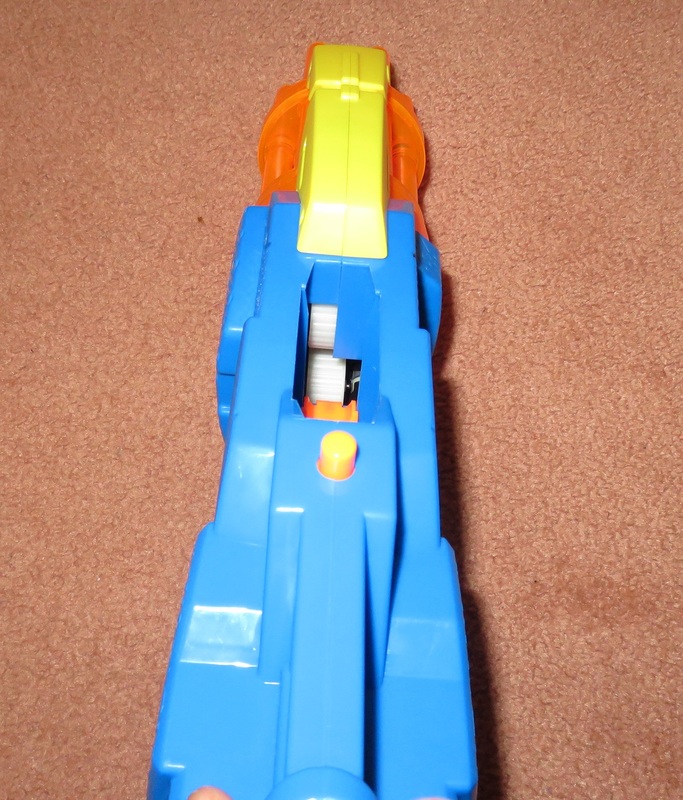 The first half of the trigger pull spins up the flywheels, and powers the spinning barrel and its lights. 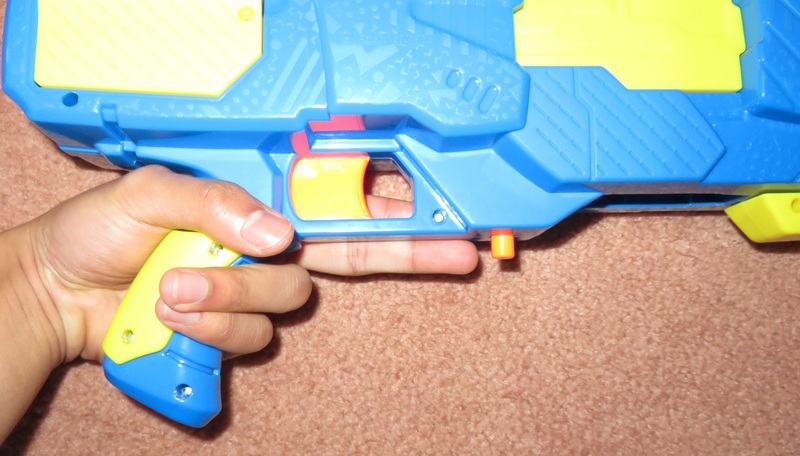 A full trigger pull powers up the pusher. 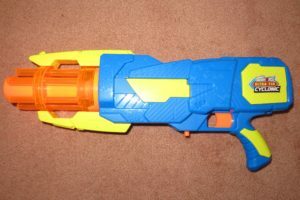 The trigger pull is one of the stiffest I’ve encountered–it’s far stronger than any of Nerf’s semi-auto flywheelers, or any other blaster I’ve used really. The return spring is very strong, perhaps unnecessarily strong. Trying to reach for the mag release. 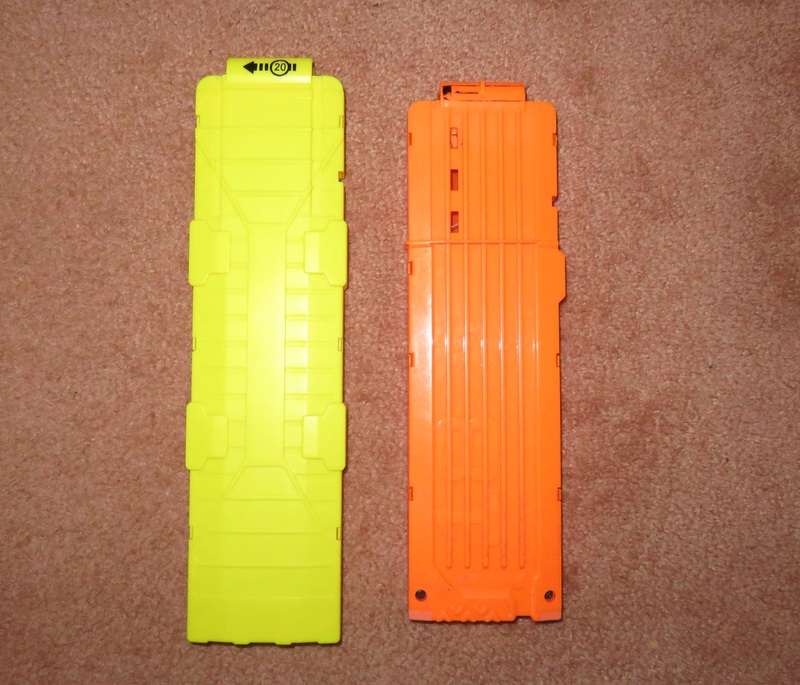 Loaded with a Nerf 18 mag. 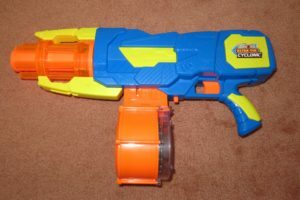 With a Nerf 25 drum. 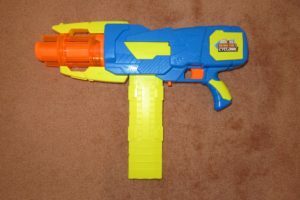 The Cyclonic is another of Buzz Bee’s mag fed blasters. 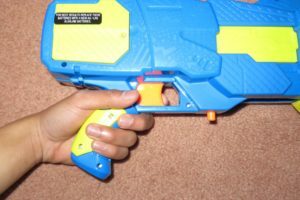 It is completely cross-compatible with Nerf’s clip (mag) system. 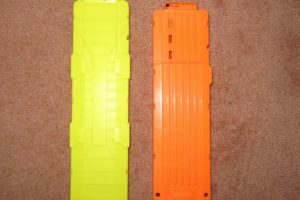 The magwell fits all mags very loosely, and many mags have a little bit of wiggle room. 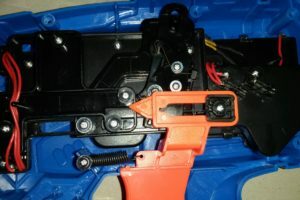 There is a single electrical safety that disables the flywheels and pusher if a mag is not inserted. 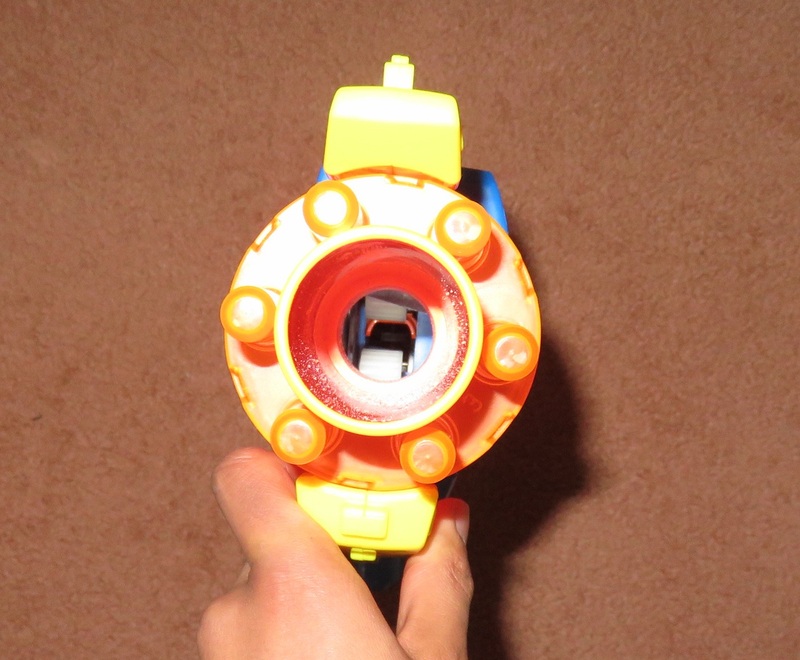 The spinning barrel will still light up and spin however–it is a “try me” feature on the box. In fact, the Cyclonic actually includes 4 AAs in box. 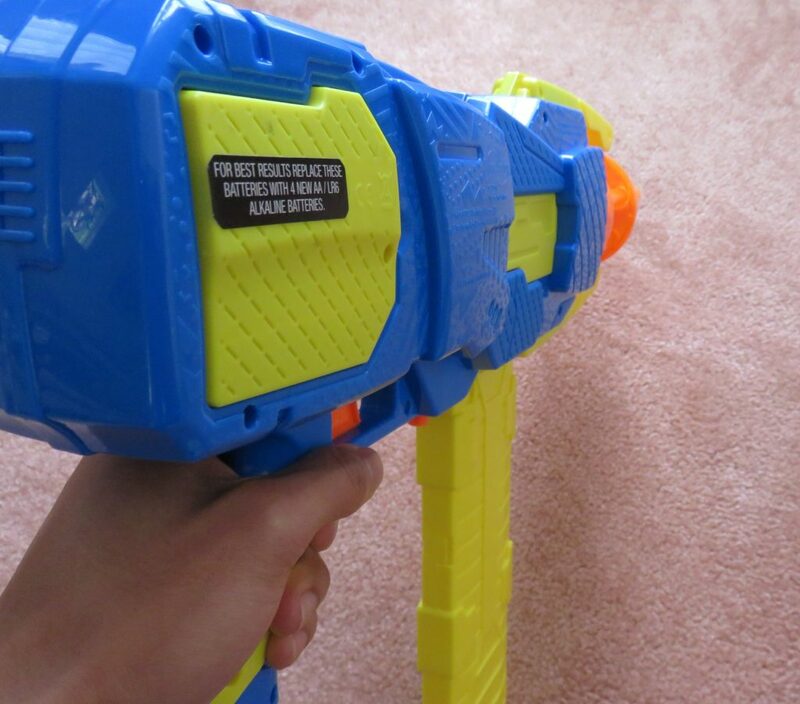 The mag release is the same as other Ultra-Tek blasters: a small cylindrical button that releases when pushed up. I found it just a bit too far to reach comfortably with my middle finger. 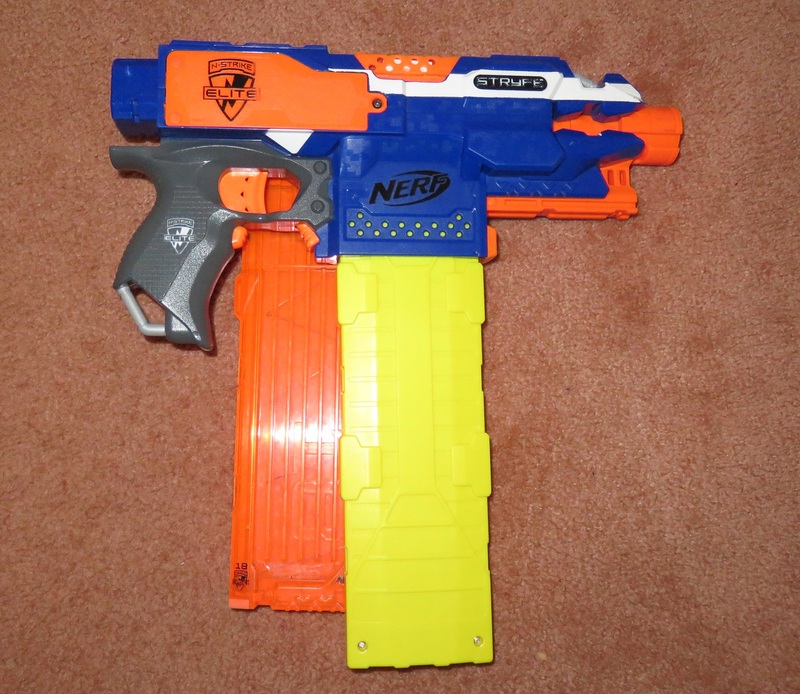 A more conventional one like with the Stryfe/Rapidstrike/etc or a lever would have been preferable. 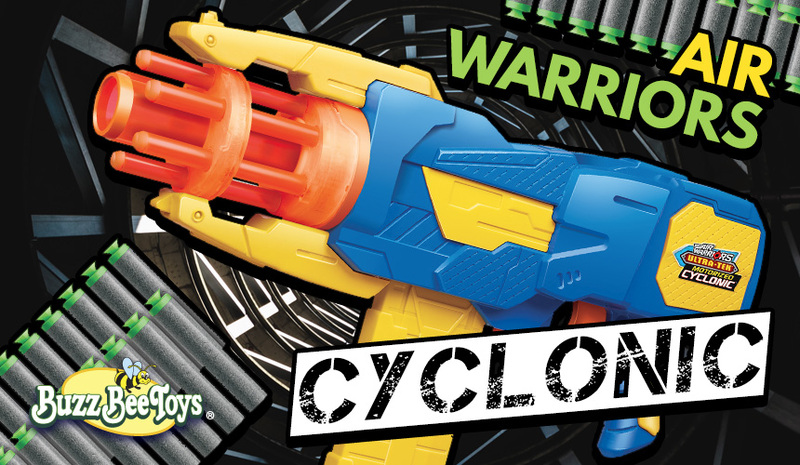 The Cyclonic is not an especially large blaster, particularly compared to beasts like the Mastodon. But for a stockless blaster, it is quite big. 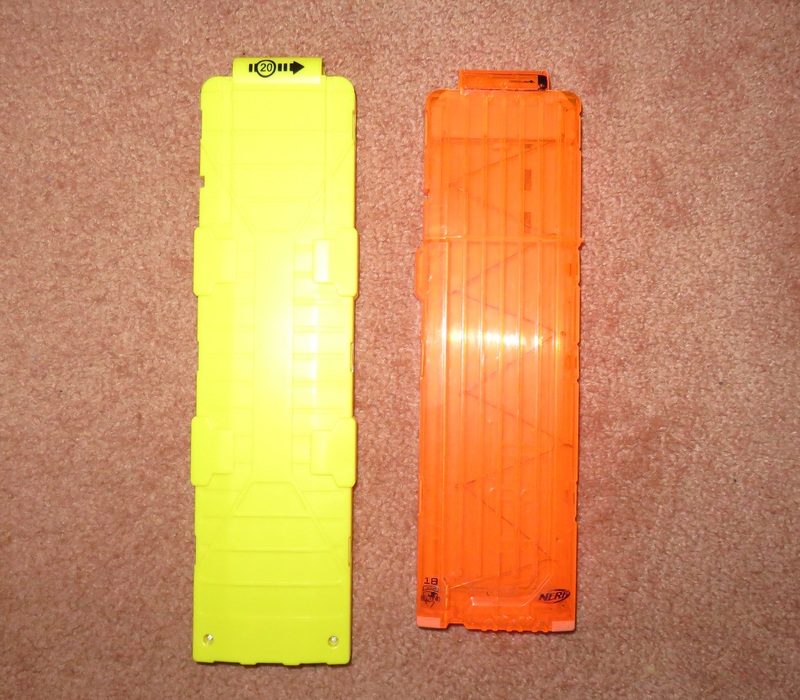 Buzz Bee 20 mag next to a Nerf 18 mag. Loaded in a Stryfe, Nerf 18 mag for comparison. Included with the Cyclonic is a Buzz Bee 20 dart mag. 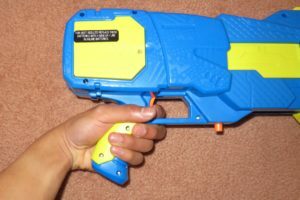 It was seen previously with Buzz Bee’s Ultra Tek Brute, but was also released in its own retail package earlier. 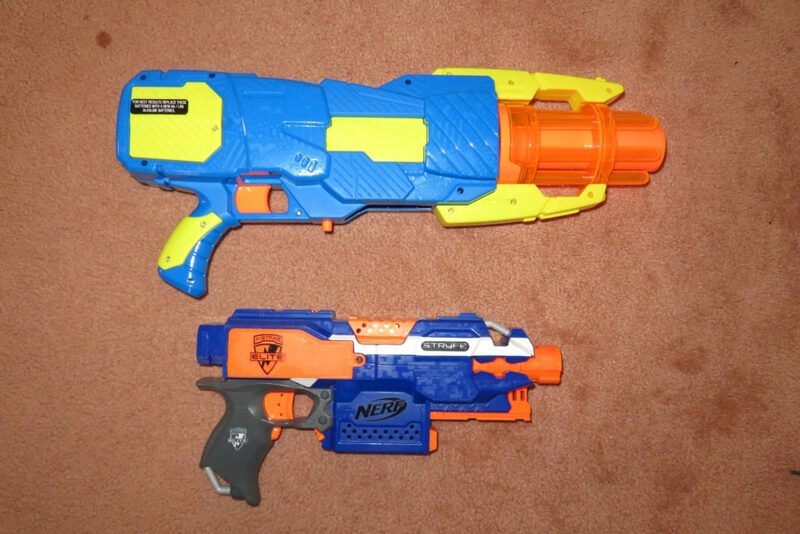 In many ways, it is directly comparable to Nerf’s 18 dart clip since they have a similar capacity and size, and are both available separately. 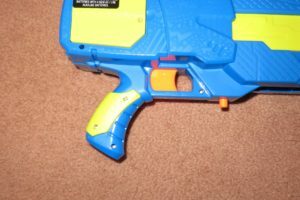 Like Buzz Bee’s 8 dart mag, the 20 dart mag is mostly compatible with Nerf’s clip (mag) system. 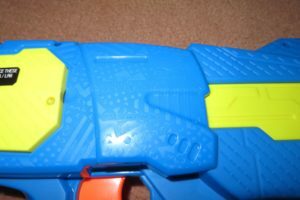 There are certain blasters in which it is very tight (such as the Rapidstrike and Rayven), but for most Nerf blasters (such as the Stryfe and Hyperfire pictured), the Buzz Bee 20 mag fits just fine. 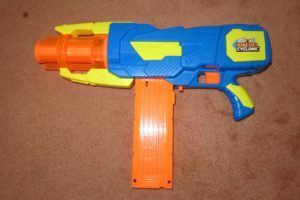 It’s a perfectly reasonable substitute for the Nerf 18 round mag, and has the bonus of holding 2 extra darts. 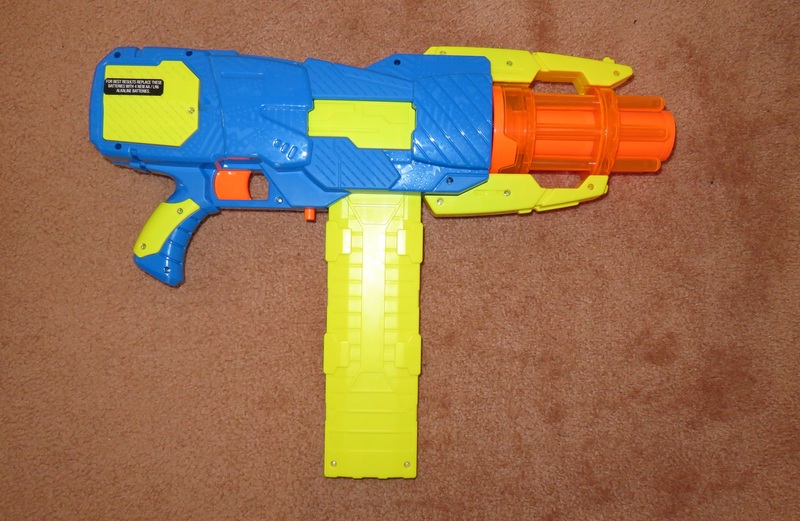 Here’s the Cyclonic loaded up with the Buzz Bee 20 dart mag. 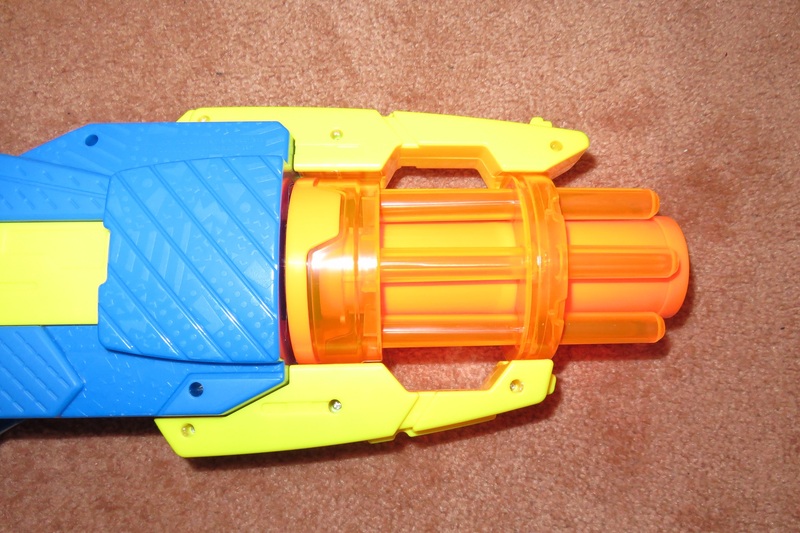 It’s an oddly proportioned blaster–on the one hand, the huge spinning barrel and general bulk suggest a heavy weapon. On the other hand, it has no stock and does not have any particularly good fore end to grip. It’s a little awkward to handle, with significant front-end weight and bulk, and no stock or rear weight to balance it. Does the (EU) Cyclonic live up to its excellent performing Ultra Tek brethren? Unfortunately, it doesn’t. Range is rather disappointing, at around 8-10 metres with Ultra-Tek darts. 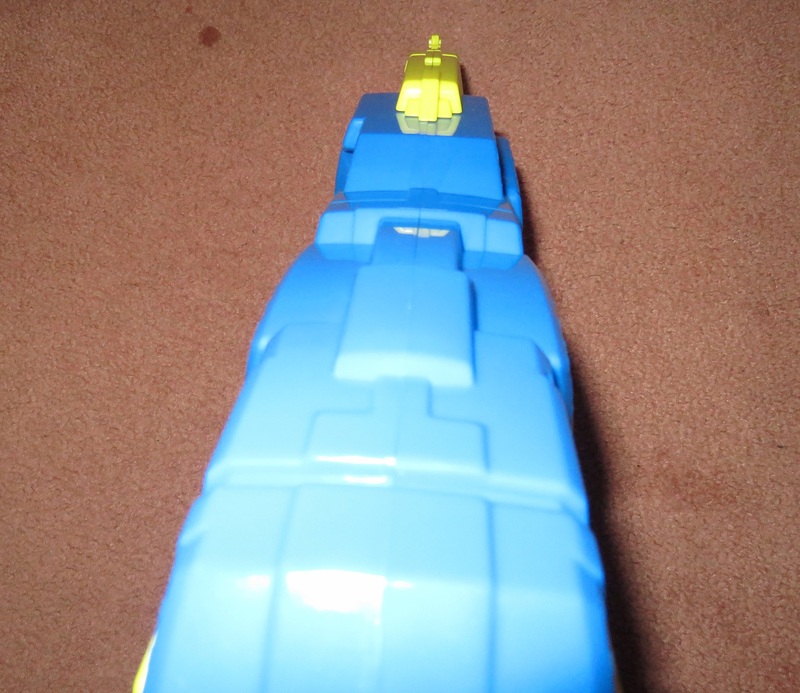 It doesn’t lose much, if any, range in rapid fire however, which is at least an advantage over most Nerf flywheelers. Accuracy is quite good, though really only because the Cyclonic is too weak to destabilise darts. 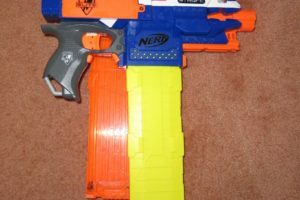 At higher flywheel speeds, you’d probably be looking at similar, perhaps worse, accuracy compared to other flywheelers like the Nerf Stryfe. Rate of fire is also quite disappointing. 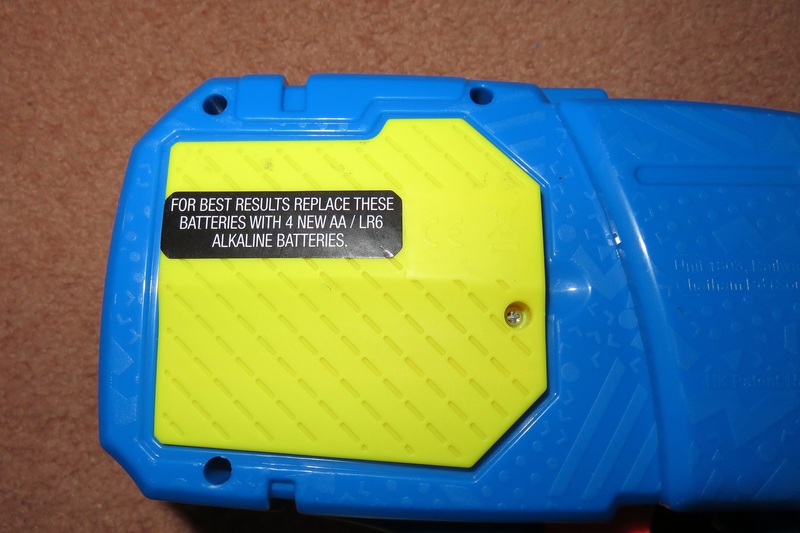 I was seeing probably around 1.5-2 darts per second on AAs (depending on the exact voltage of the batteries). Performance from the Buzz Bee Cyclonic is highly dependent on having a set of good AAs. 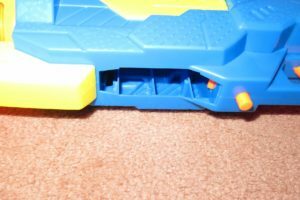 Initially, I tried it with a set of rechargeables at ~1.1V each, and it struggled to cycle through any darts unless the mag was half empty. 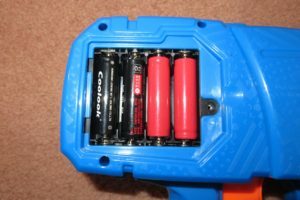 I switched to a set of relatively new non-rechargeables (~1.3V) and it performed much better, but still showed signs of struggling. The Cyclonic is an excellent example of why typical AA cells (and typical C/D/etc cells, for that matter) should not be used in any high level flywheeler. 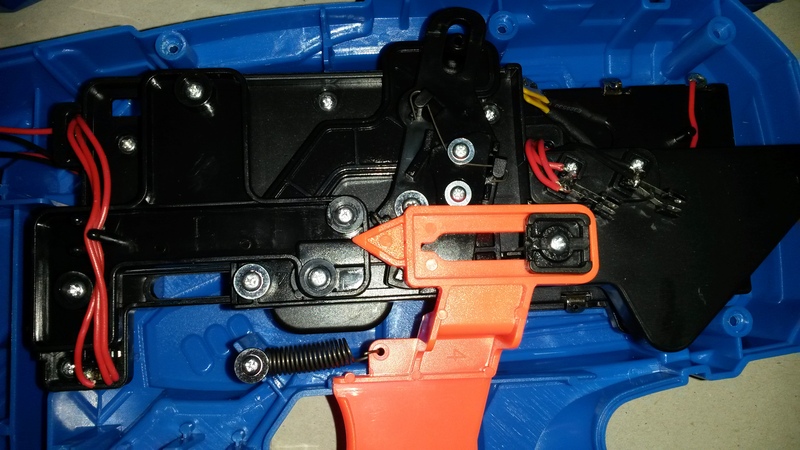 Even in a basic semi-auto flywheeler powering just 2 motors, these typical cells struggle to provide the motors with enough power, resulting in very long spool up and very poor torque. The Cyclonic has a total of 4 motors and 2 (relatively low power) LEDs. Compared to a typical semi-auto, it pulls far more current, and it is very apparent when using it just how much the cells are struggling. Once the flywheels and barrel are spinning at max speed, as soon as the pusher is started, both of them decelerate substantially. They accelerate back up to speed very slowly. Furthermore, the pusher is substantially slower actually feeding darts than when the mag is empty. Something else to note is that I actually had to do a bit of fixing on my Cyclonic. When I first got it out of box, it was constantly misfiring. I noticed that one of the flywheels seemed to spin slower than the other one. I determined that one of the motors was slower than the other, and upon opening that motor, I found the cause. For whatever reason, that motor’s brushes were covered in a grey paste that added friction to the commutator, thus slowing it down. 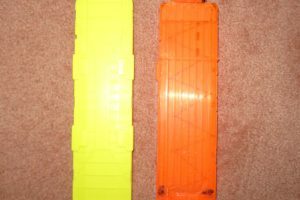 Upon cleaning out the paste, the motor then quickly matched speed with the other motor, and the blaster stopped misfiring. Unfortunately, given that its performance is all round underwhelming, the (EU) Cyclonic does not have a role it excels in. 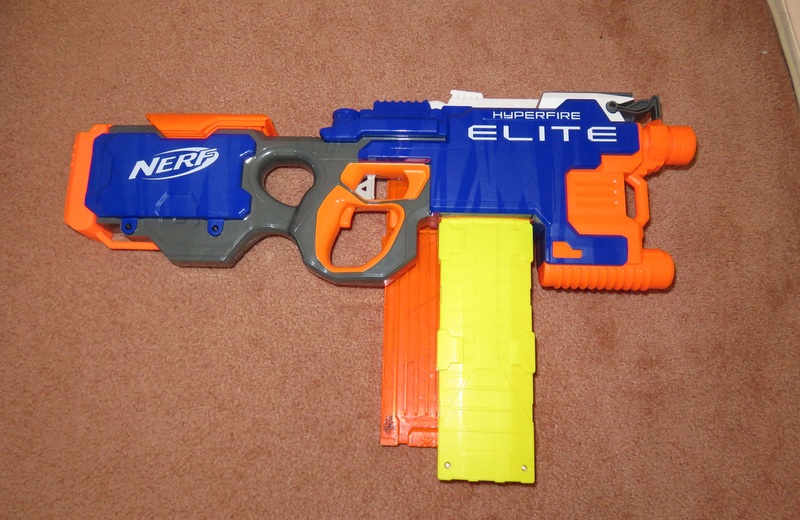 It does have one notable advantage, in that its flywheels spin up much faster than typical stock (grey trigger) Nerf flywheels. 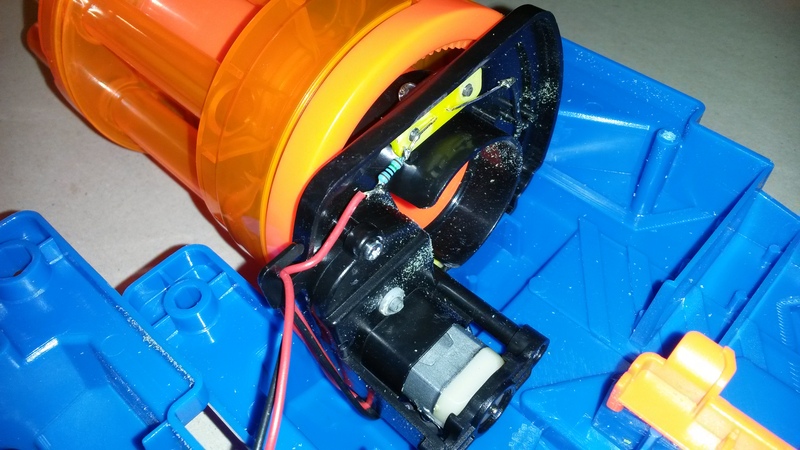 The flywheels reach full speed in less than a second, where most (grey trigger) Nerf flywheels still have a ways to go to reach top speed. This lets you get good shots off much faster with the Cyclonic than most other flywheelers. Besides that though, there’s nothing really distinguishing it from the pack. 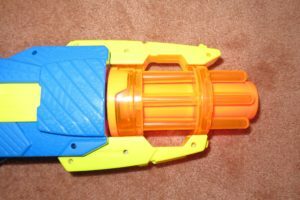 Many blasters can easily match and exceed its range and ROF. Unless you absolutely must have a full-auto mag fed flywheeler on a low budget, there’s nothing really that the (EU) Cyclonic does particularly well. 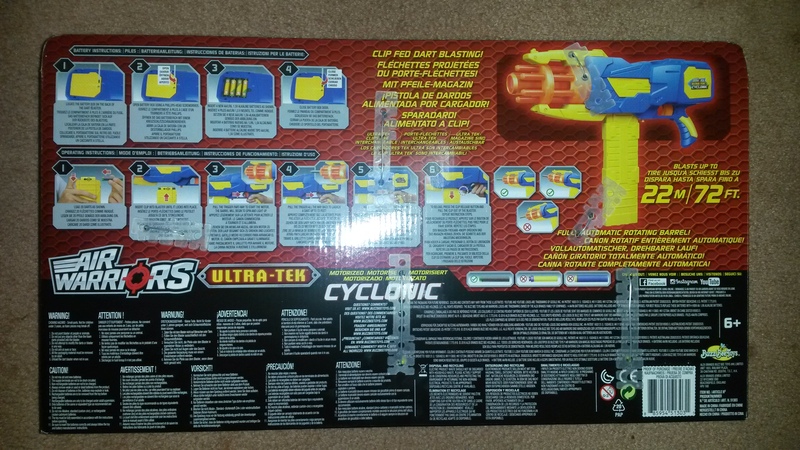 The Buzz Bee Cyclonic has an RRP of 20USD, which is on par with the Stryfe’s RRP. 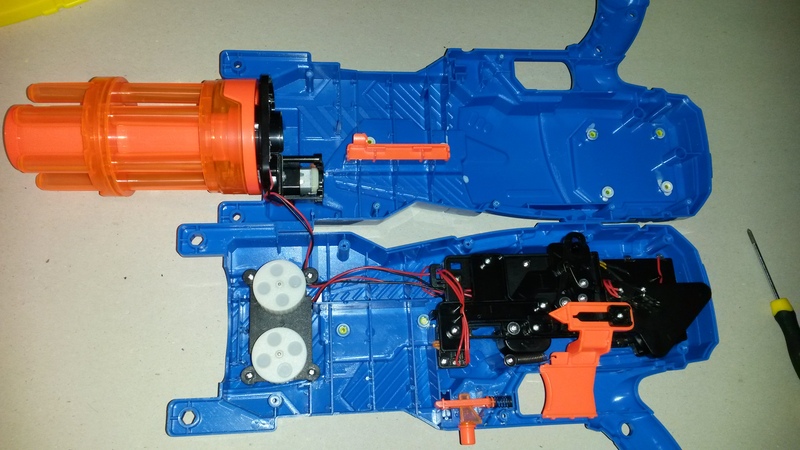 The least you’d be looking at for one of Nerf’s full auto flywheelers is 30USD (RRP). 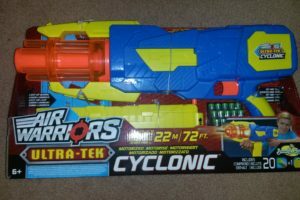 If it were a better blaster, the Cyclonic would be a great deal (and if the US spec one is on par with the other Ultra-Tek blasters, it would be). 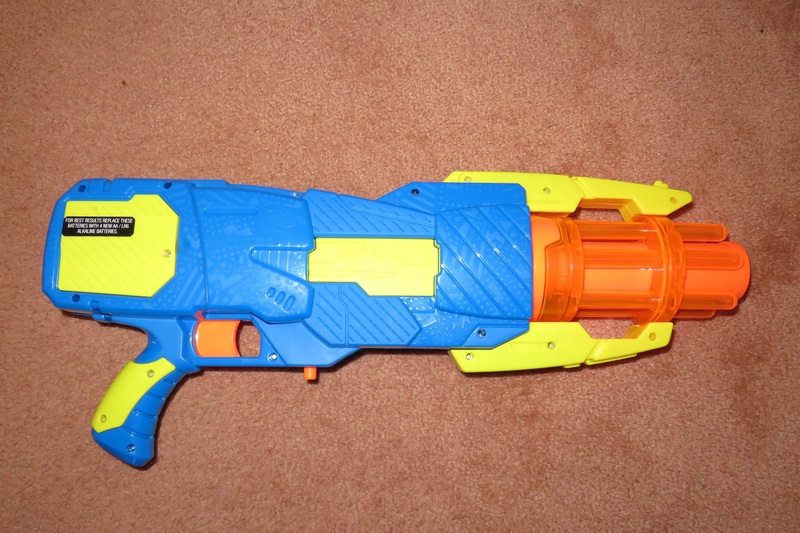 However the (EU) Cyclonic is just not that great a blaster and therefore doesn’t represent exceptional value. 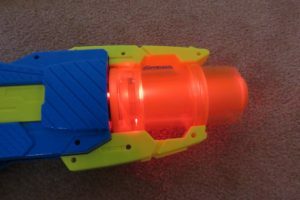 There’s no doubt it’s still fun, as everyone loves spinning barrels, but it could easily have been substantially better without them (see the Buzz Bee Brute, for instance). 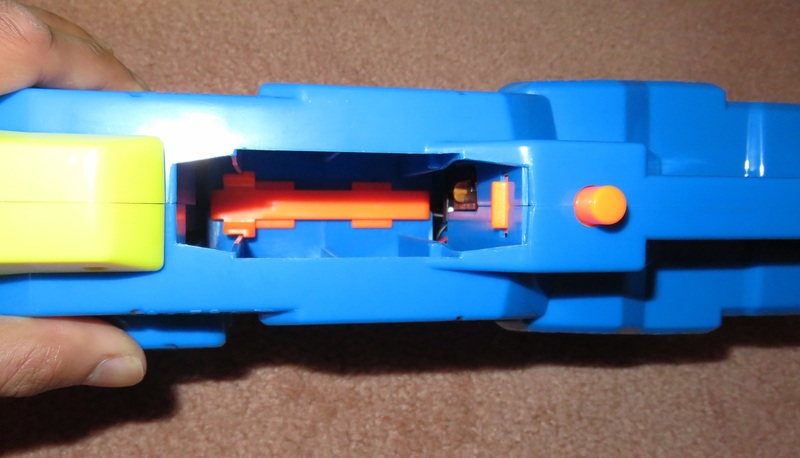 Close up of the rotating, light up barrel internals. Close up of the pusher mech. The majority of the Buzz Bee Cyclonic’s internals are relatively ordinary. The spinning barrel mech is pretty much what you’d expect. A 130 motor drives a gear train which, in turn, drives the spinning barrels. 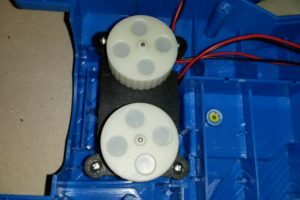 The LEDs are wired in parallel with the motor. 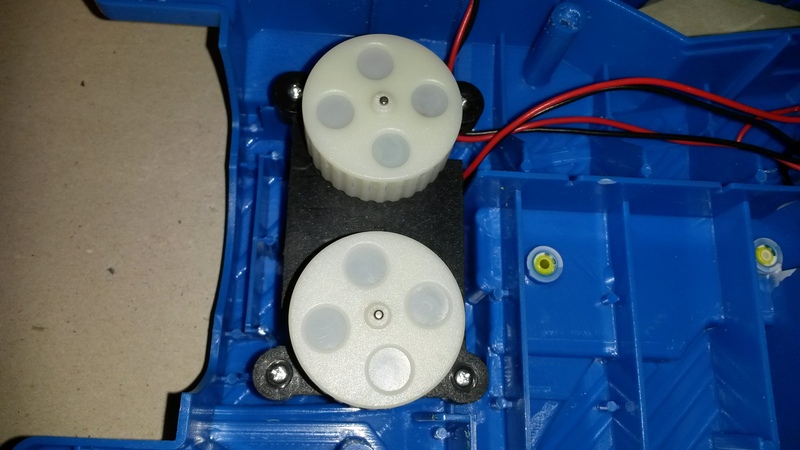 The flywheel motors are mounted on a plate which is screwed into position. 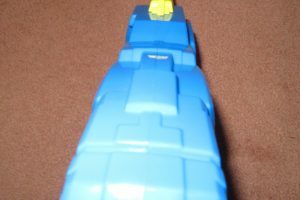 The flywheels are toothed in typical Buzz Bee fashion. 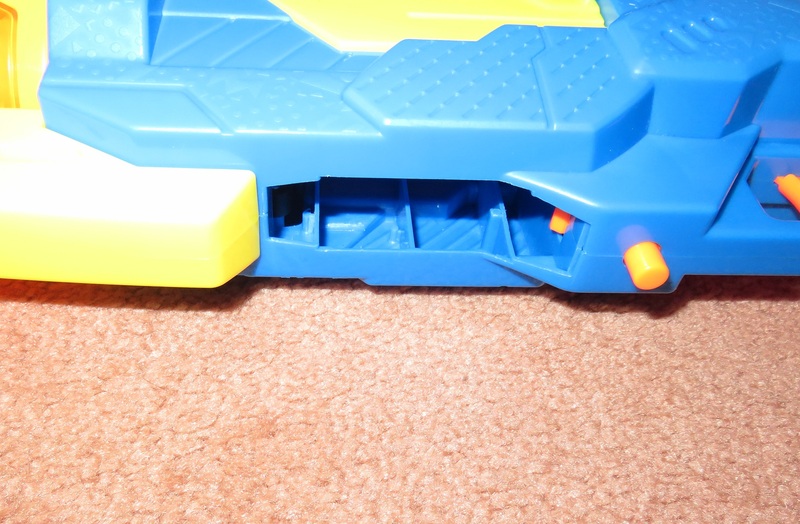 The trigger pushes against two tab switches, which power the flywheels and barrel, and pusher respectively. It’s worth noting that the Cyclonic’s flywheel cage has a much larger flywheel gap than usual. 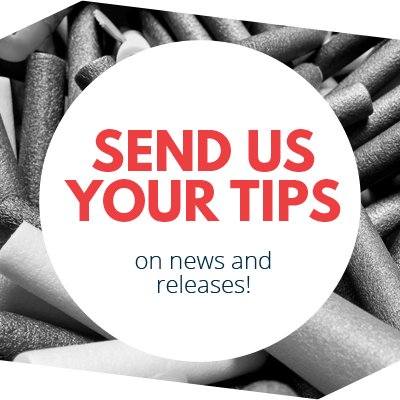 This means it applies much less friction to darts that are fed through. 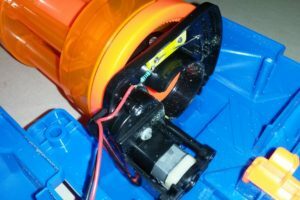 Since maximum flywheel velocity is determined by friction, the Cyclonic is limited to a much lower flywheel velocity ceiling than typical Nerf flywheelers. It is entirely possible to alter the cage to fix this issue, but it is something worth noting. The pusher mech is rather different. 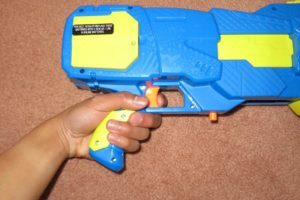 Although it cycles as normal while the trigger is held, when the trigger is released, the pusher is automatically mechanically retracted. 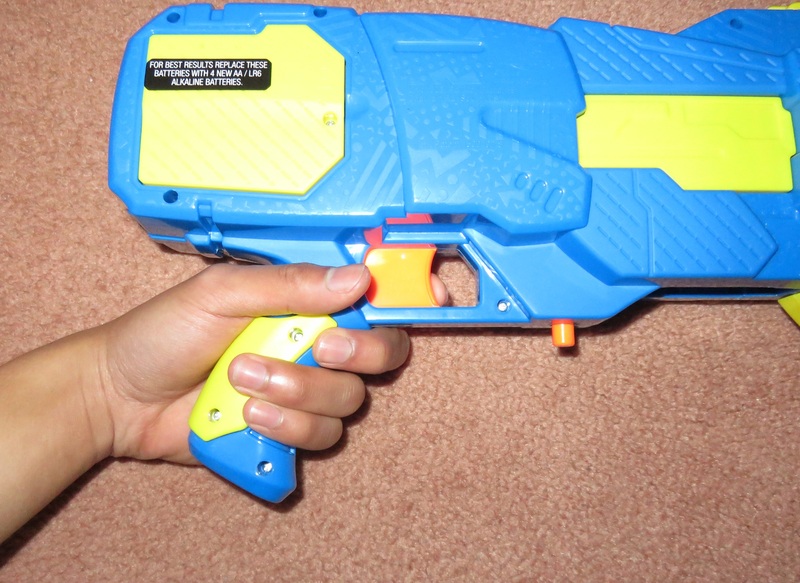 This is in contrast to the Nerf Rapidstrike, where the trigger only interacts with the pusher electrically. The Cyclonic mech’s main advantages are the impossibility of pusher runaway, and the guarantee of the pusher returning. 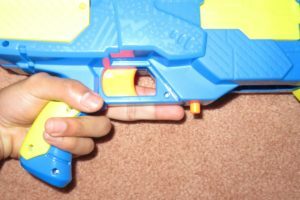 Its main disadvantages are the inability to complete a partial cycle if the trigger is released early, as well as the painfully long trigger pull. 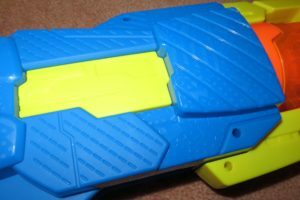 This entry was posted in Dart Blasters, Reviews and tagged 22m, 72ft, buzz bee, cyclonic, europe, review, ultra tek on August 19, 2016 by Outback Nerf.